Old map by SANTINI -Nouvelle mapp monde : dediee au progres de nos conaissanceas . . . Title: Nouvelle mapp monde : dediee au progres de nos conaissanceas . . . Size: 18.1 x 25.6 inches. Condition: In very good condition with two minor areas of spotting, very minor toning in the bottom margin and a few very minor margin chips. A 4.5 cm erased library stamp is hardly noticeable in the image. 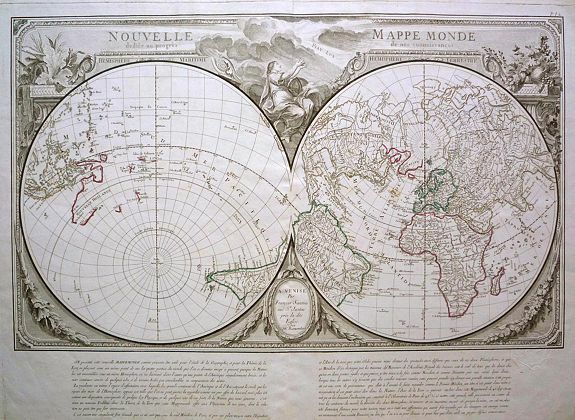 An elegant world map designed with the prime meridian through Paris. The hemispheres are rotated through 45 degrees - an unusual projection for a world map based on work of the French Academie Royale des Sciences. Interesting features include a "Mer de L'Ouest" or "Sea of the West". Paris is located at the center of the hemisphere, so that Europe, Asia, Africa, North America and most of South America appear together: the left sphere contains Patagonia, Australia and the East Indian Islands. The two halves are named Hemisphere Maritime and Hemisphere Terrestre. Australia and New Zealand are only shown partially and the erroneous 'Mer de L'Ouest' appears in northwest America, with a large 'I. Nouvelle' just south of the Bering Straits. Jesso, north of Japan, is part of mainland Asia. The map is of interest for the name of the sea between Korea and Japan, here called "Mer de Corée".